In their recent report on subsea electric cable between Iceland and Britain, Kvika bank and Pöyry predict what new power projects will be developed in Iceland to fulfill the electricity demand. In this article we will focus on why wind power is likely to be an important part of the power development in Iceland. Also we will explain how the information in the said report about cost of wind generation is outdated, and how wind power in Iceland is far more competitive than presented in the report. 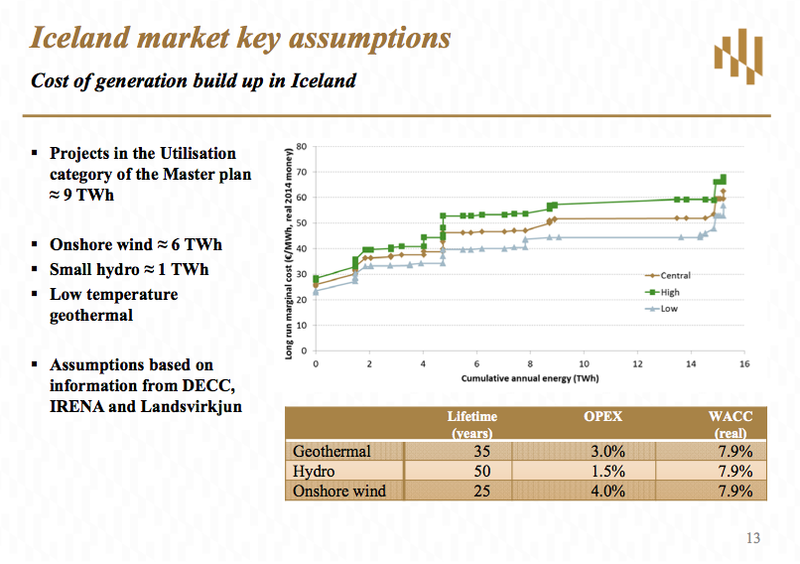 According to the report by Kvika and Pöyry, levelized cost of energy (LCOE) for 6 TWh of new wind power generation in Iceland will on average be approximately 51-52 EUR/MWh (as can be seen on the top-slide below, which is from a presentation by Kvika/Pöyry). It is interesting to compare this cost figure with LCOE for wind generation as represented by the financial firm Lazard. Note that the cost figures presented by Lazard are in USD, and here we use the average exchange rate in 2016, where one USD equals 0.9 EUR. In 2014, Lazard LCOE for onshore wind was 33-73 EUR/MWh (with 53 EUR/MWh as average). In 2015, Lazard LCOE for onshore wind was 29-69 EUR/MWh (with 49 EUR/MWh as average). In 2016, Lazard LCOE for onshore wind was 29-56 EUR/MWh (with 42.50 EUR/MWh as average). The report by Kvika/Pöyry, mentioned above, was officially published around mid-year 2016. However, the main work on the report took place in the latter half of 2015. This means that the most recent LCOE-figures for wind power available when the research for the report was ongoing, were LCOE-calculations for the year of 2014. Thus, it may not be surprising that the average LCOE for wind in the report by Kvika/Pöyry is close to Lazard’s result as presented in their report from September 2014 (LCOE version 8.0). The numbers are 51-52 EUR/MWh and 53 EUR/MWh, respectively. We want to emphasise that Kvika/Pöyry did not use Lazard as a reference. Instead, the assumed LCOE in the report by Kvika/Pöyry is based on numbers from IRENA (IRENA Power Costs Report 2014, published in January 2015). It is also important to keep in mind that cost figures used by Kvika/Pöyry included the average cost of linking wind power farms to the grid. However, what is especially important is how the figures for LCOE of wind power generation were presented in the work by Kvika/Pöyry. 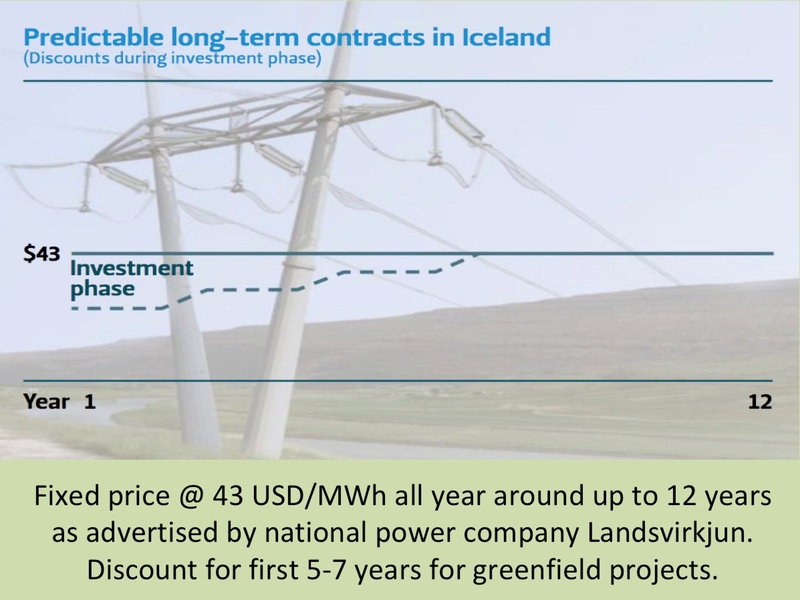 While the companies estimated the cost of each new geothermal- and hydro project to be developed, they simply used the average LCOE for wind (approximately 51-52 EUR/MWh) as a fixed LCOE for all new wind power projects in Iceland generating up to 6 TWh annually. Which is a very general and/or imprecise presentation of LCOE for wind. It would have been much clearer, for the comparison, to estimate not only average cost of wind, but also the lower cost and the higher cost of wind power, when developing 6 TWh of new wind generation. Having regard to the figures from Lazard, it can be expected that such a methodology would have resulted in a LCOE between 33-73 EUR/MWh. This is reflected by the red line on the graph at left (the average cost being the same as estimated by Kvika/Pöyry). It should also be noted that due to good wind conditions in Iceland, the average cost of 6 TWh of new wind generation development might be even lower than the average given by Lazard or IRENA. 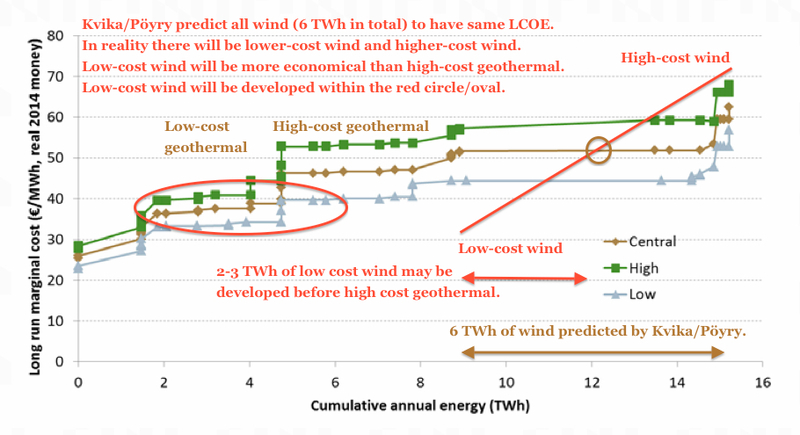 Then, more than 2 TWh and possibly up to 3 TWh of new wind generation might be less costly than the high-cost geothermal projects planned in Iceland. What now becomes quite clear, is how substantial low-cost wind power can be expected to be developed in Iceland, before constructing some of the new high-cost geothermal plants. It seems likely that at least up to 2 TWh of new wind power may be developed in Iceland much earlier than projected by Kvika/Pöyry. This conclusion was missing in the work of Kvika/Pöyry. As a result, Kvika/Pöyry under-estimated the possibilities of wind power in Iceland in the coming years. In addition, the cost figures used in the report by Kvika/Pöyry may already be outdated. LCOE for onshore wind has gradually been decreasing. 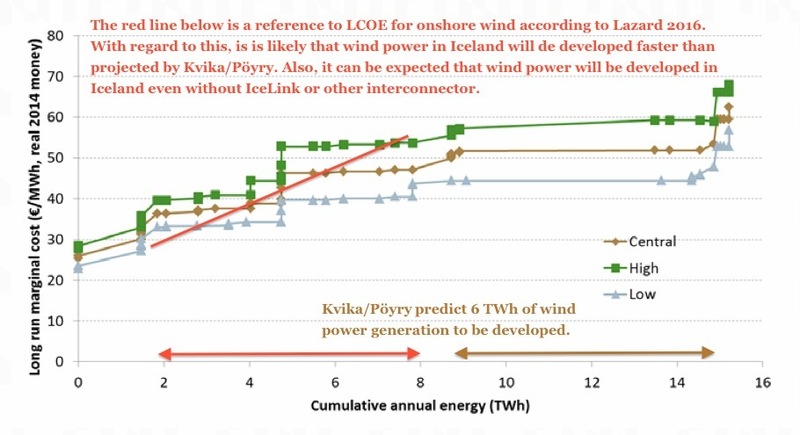 Therefore, wind power may develop faster in Iceland than in the scenario(s) presented by Kvika/Pöyry. According to the most recent report by Lazard (version 10.0 from December 2016), LCOE for wind in the USA is now estimated to be between 28 and 56 EUR/MWh (with an average of 42 EUR/MWh). These figures are strong arguments for assuming wind power in Iceland will be even more competitive than predicted a couple of years ago. This is explained by the additional red line on the last graph, which is based on the most recent figures from Lazard. The conclusion is that wind parks at sites in Iceland offering high capacity factor, will be more economical than some – or even many – of the geothermal projects now being considered in Iceland.